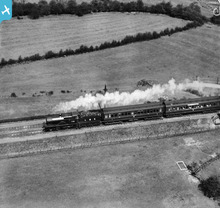 Both coaches in this photograph are of a clerestory roof type, each riding on two six-wheel bogies. The second coach in the rake is marked Dining Car. The number of this locomotive is 77? - which would be a post 1907 grouping number. This identifies the locomotive as originally numbered 86?, built 1904-1905 in Derby for the Midland Railway. Designed by Samuel W Johnson, between 1900 and 1905 some 80 locomotives of this type were built - of which 20 were of this sub-type, having a G8A boiler at 200psi. This was a 53 ton 2 cylinder Class 3 4-4-0 engine, with a Belpaire firebox. All engines of this type had been withdrawn by 1953 and none are preserved. Close inspection might suggest that the locomotive number is 770. A superb photo of a Johnson 3P in fukll flight. 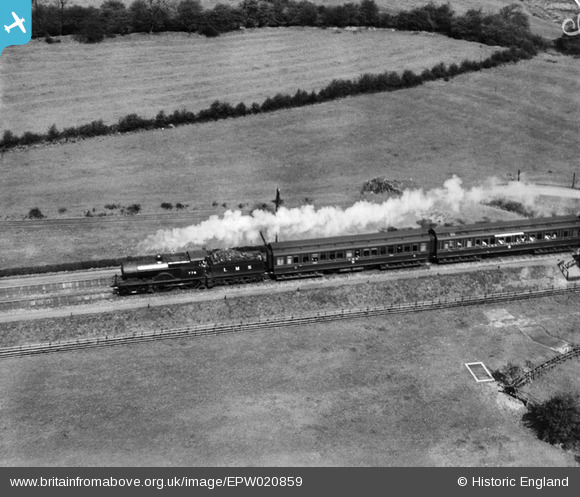 Note the Midland Railway designed and built 12 wheeled Clerestory Coaches. Another superb photo! Note the 12 wheeled 'Midland Railway' designed Clerestory Coaches.